similar to a dog feeding dish. A dog feeding dish is well designed for its purpose and that is not to tip over and spill the contents as a dog puts his nose and mouth in the dish and pushes food against the rim so he can grasp it. Therefore it is considerably wider at the base than the rim. Yet we would like to rise a step above designing dog food bowls. I had an artist who had looked critically at my earlier turning attempts give me some very good advice. He said there are three design elements in any vessel. They are the rim, the body and the base. In well designed vessels they should all bear a harmonious relationship to each other. What that relationship is you have to determine yourself. Just using mathematical formulas won’t work well in many cases. In general, as a starting point, the base should be perhaps a third of the diameter of the rim. Smaller than that makes the bowl look delicate but it tips over easily. Wider than makes a very stable vessel but it looks the opposite of delicate, that is, heavy and dull. Superimposed on that ratio of rim to base are many other factors which means that a rigid formula will not give the desired result all the time. Perhaps you want a piece to convey strength and stability. A wider baes is in order. If you want to convey lightness then a smaller base is called for. If you want the vessel to appear to float, then a small foot at the base will give the illusion of lift like the vessel is floating since the foot is hidden under the curve of the lower part of the bowl. For those who wold like to go more deeply in to bowl design I highly recommend a book by Richard Raffin, a well known turner and teacher from Australia. The book is Turned-Bowl Design. It has gone through more than one edition and is available at book sellers and often in catalogues marketing wood turning tools. In a previous post I discussed one way of shaping the body of the vessel. This was the calabash, or gourd-like design, employed so successfully by artisans in Hawaii using just coral to shape native woods. It is pleasing because it is a shape we see in Nature frequently. Undoubtedly it is a shape dictated by natural laws and these are universal principles that are used over and over in creation. We like what we know and when we see what we know the recognition produces an emotion of pleasure in us. In this post I would like to discuss another pleasing shape. That is the ogee curve. This is just a term used in the past to describe the S curve. A highway that curves to the left and then to the right is a common example of this curve familiar to all of us. We are also intimately connected to it when we learn to write the letter S. In bowl turning we tend to stretch the S out by the ends to make the curves more gentle. 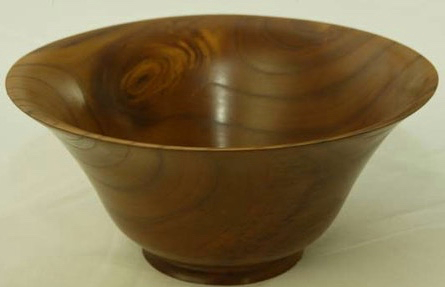 In this example of a thin cherry bowl there is a slow, even unfoldment of the curve from the base to the rim. 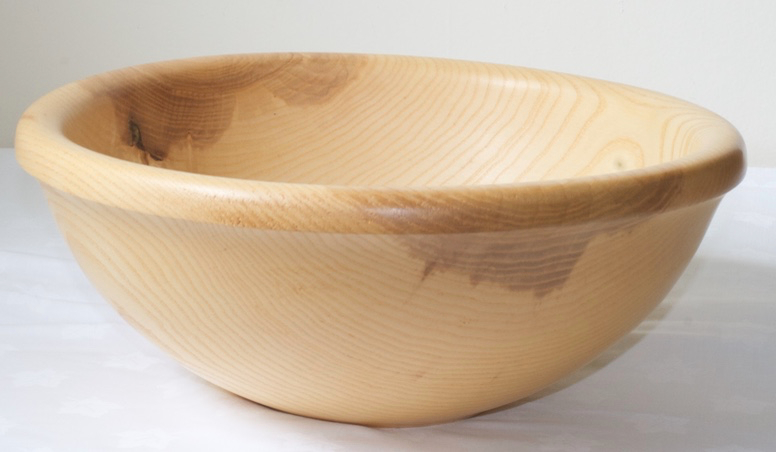 In this Russian olive bowl the curve is rather tight at the base and then expands more slowly as it approaches the rim. 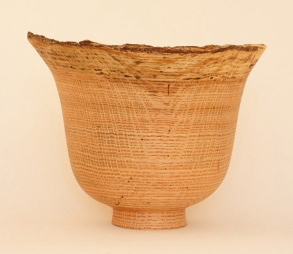 In this example, from a natural edge bowl from a very old red oak tree, the middle portion of the curve is greatly extended to give the vessel more depth. Notice how the perfect symmetry of the ogee curve contrasts with the irregular shape of the natural edge rim from which the bark has been removed. 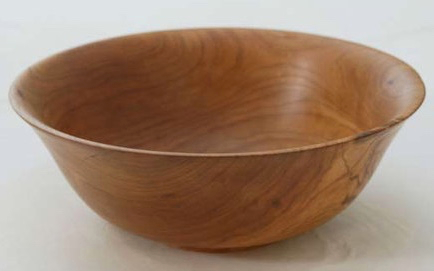 In this ash bowl the top and the bottom of the ogee curve are so tight that it might be missed. The top of the curve is almost concealed by the overhanging rim and the bottom of the curve is lost as it briefly tucks into the tiny foot. In this this cherry bowl the s curve flows very slowly from the base to the rim producing a shape that invites you to pick it up and hold it. Hopefully these few examples will inspire you to start experimenting with the ogee curve and start producing beautiful vessels.